Slice your eggplant into thin rounds just under 1/2 inch (not quite 1/4 inch), then sprinkle both sides of the flesh with a little sea salt and arrange in a colander to help draw out some of the moisture and bitterness. Let set for 10-15 minutes, then rinse with cool water and thoroughly pat dry between two clean towels. Preheat oven to high broil and place an oven rack near the top of the oven. Arrange the dried eggplant rounds on a baking sheet lightly spritzed with non-stick spray and drizzle both sides of the eggplant with a little olive oil. Sprinkle with a very small amount of salt. Broil on high for 4-5 minutes on each side, watching carefully as to not let them burn. Flip at the halfway point to ensure even cooking. Once the eggplant appears tender and both sides have golden brown color, remove from the oven and wrap loosely in foil to steam. After a few minutes, unwrap and peel the eggplant skin away. It should come right off. If you pack your roasted eggplant into a 1-cup measuring cup, it should be almost 1 cup. Place eggplant in a blender with the 1.5 cups almond milk, 2 Tbsp nutritional yeast, minced garlic, cumin, chili powder and cornstarch and blend on high until smooth and creamy. Taste and adjust seasonings as needed. I added a pinch more sea salt and a little more nutritional yeast. To thin, add more almond milk. NOTE: If it isn’t looking as thick as you want, thicken with a slurry of cornstarch by adding an additional 1 tsp cornstarch to a small bowl with a little almond milk. Whisk to combine and then stir back into the pot. This should thicken it right up. Serve with chips, crackers or veggies. Or use it for in burritos, quesadillas, tacos, or on top of a veggie&rice bowl, or on pasta…the options are ENDLESS!!! 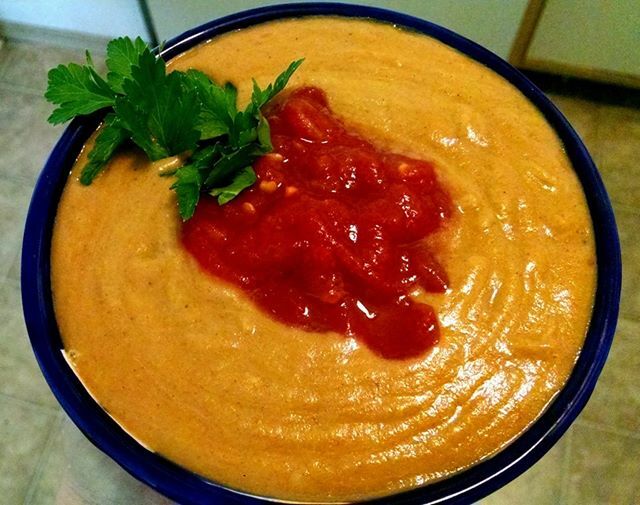 Posted on May 12, 2014 by OregonKitchenPosted in VeganTagged cheese alternative, dairy-free, dairy-free cheese, fast meal, fast recipe, fresh, gluten-free, healthy, healthy cooking, healthy meals, low-calorie, low-calorie cheese dip, low-calorie dip, quick, quick meals, quick vegan, vegan, vegan cheese, vegan cheese dip, vegan cooking, vegan lunch, vegetarian.